What’s the most amazing, weird, funny, bad, good thing that has happened to you in the lab? One day as a graduate student I was finishing up a long weekend of work and was ready to go home. No one else was around in our lab or even in the building that I could see. All I had to do is wash my hands, go out to my car and enjoy at least part of my weekend. I reached up to turn on the water in the lab sink and gently bumped the faucet. It mysteriously snapped off and a geyser of water shot up and hit the ceiling 8 feet up. The faucet snapped off that easily? Really? A few hundred gallons of water a minute were pouring out. I dove down to look under the sink–but there was no shutoff valve. I collected all the lab notebooks in the room and moved them next door. I called the university emergency number but had to leave a message. I covered the geyser with a large heavy plastic bin to at least contain the damage and began moving equipment away but the water was still flowing. There were several inches of water on the floor and it was rising fast. Finally after about half an hour a maintenance person showed up, nonchalantly went into some locked utility hallway and shutoff the water. An eerie calm came over the lab as the rushing sound of the geyser was gone. At that point there were 6-10 inches of water on the floor covering the entire lab. Water was pouring off of all the lab benches and dripping from the ceiling. Not good. I was soaked. Amazingly no equipment was ruined, no lab notebooks got wet since I managed to move them all. I went into the rooms on either side of the lab and, yep, the water was already starting to seep into those rooms as well under the walls. The guy started to use a wetdry vac to pull up the water, which he said would take a few hours. Then I had to make one of the hardest phone calls ever. 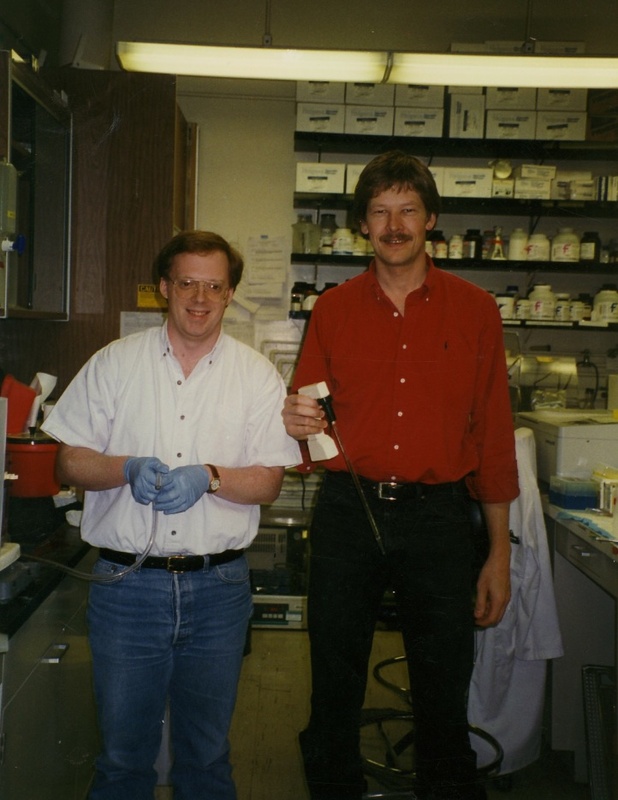 I called my mentor, Mark Kamps (see picture circa 1994 above of Mark on the right, and me on the left…yeah I’m short compared to Mark, but so is almost everyone) and told him what had happened. He was amazingly calm and understanding. That wasn’t how i imagined finishing my weekend, but Mark’s reaction made it a lot better than it could have been. The Great Flood of 1994 was over, but every now and then when I wash my hands in the lab it pops back to mind…. What’s something out of the ordinary that has happened to you in the lab? Please make a comment on it.